This is the day where we, as a congregation, begin the mass by singing Hosannas and welcoming in Jesus! It’s quite an exciting time for all. My church started off in the Catholic school’s gym for the part with the palms and then parading across the street and packing the pews. It was quite a neat experience! There are a lot of things to say about Palm Sunday… it is the day that we read through the Passion narrative and contemplate how the mob that greeted Jesus with Hosannas soon turned to cries of “Crucify Him!” later on. But! For today, I would like to focus on another unsung hero and Christ’s unlikely sidekick of the day… the donkey. Not only is there poetry about this creature, but there is art depicting this unlikely pairing of Christ, the King of Kings, and this simple donkey colt! Check out this artwork! Entry Into Jerusalem, by Giotto di Bondone, c. 1304-06. Scrovegni Chapel, Padua, Italy. 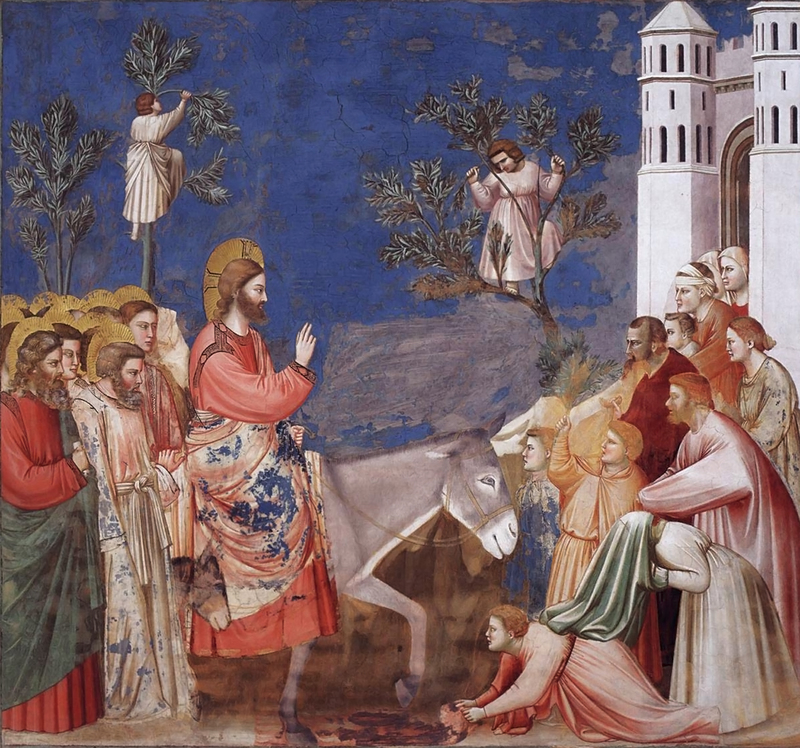 I have to admit… I have a soft spot for Giotto’s depictions of donkeys. He draws them in such a way that really brings out their comical side… honestly, it looks like they’re smiling. Which is entirely appropriate, as donkeys are quite intelligent and mischievous creatures with a wicked sense of humor! And, you know how they’re commonly depicted as being stubborn? I can confirm that this depiction is entirely correct! But something about donkeys might escape our modern minds completely… they are stubborn and it takes a while to train them to do anything. And, if they don’t want to do something? They are quite happy to kick you off! In fact, that’s true for horses as well. Horses and donkeys both need to be trained to carry humans, otherwise the animal will be more than happy to kick off the human who dares to ride it. Which makes it that much more incredible that Jesus was able to ride into Jerusalem in the first place… especially on a colt that had never been ridden on before. Yes, Jesus had cured many people and even raised the dead… but to be able to ride in on an untrained donkey? That’s a miracle in itself! Jesus is indeed the master of all creation and, at this moment when He enters into Jerusalem, He is clearly recognized as such by all of creation — even by a simple donkey! May we recognize You as our master everyday and may we submit to Your Will as easily as this donkey did. This artwork was almost featured in my book, The Sorrowful Mysteries, which pairs religious artwork of the Sorrowful Mysteries with the prayers of the Rosary! To take a peek at the book or buy it, click here! ← Sneak peek of the Glorious Mysteries!